On Sunday, 11th November, the centenary of Armistice Day 1918, marking the end of the First World War, the first sounds will be of a bell and silence. On each of the four minutes leading up to the eleventh hour of the eleventh day of the eleventh month – one minute for each year of the four year war (1914-1918) – a bell of the Cathedral will toll once followed by a minute’s silence. At 11 a.m. the traditional two minutes’ silence will be observed, after which, as bells of churches did in 1918, all 12 Cathedral bells will ring out before the morning Service – a Requiem Eucharist, at 11.15 a.m. The setting of the music of the liturgy will be Requiem by Gabriel Fauré. Sung in Latin the texts are supremely appropriate to the occasion, such as ‘Rest eternal grant unto them, O Lord…’ and ‘Lord, have mercy’. Following the reading of the names, Libera me is sung: ‘Free me, O Lord, from everlasting death …’ During Holy Communion, Pie Jesu is sung: ‘Merciful Lord Jesus, grant them rest.’ In addition some traditional hymns will be sung at the Service, which will conclude with In Paradisum: ‘May the angels lead thee into paradise.’ And the bishop, clergy and people will leave in silence. In the afternoon, at 3.30 p.m. on Sunday 11th November there will be a Service to Commemorate the End of the First World War. Music and symbolism, as well as silence, will be at the heart of this Service which will be attended by representatives of other churches, public representatives, members of the Defence Forces, community representatives, veterans, and the consular corps. An original First World War wooden cross, which was a temporary marker on a grave on the Western Front, ordinarily on view in the Cathedral, will be placed centrally to symbolise the 10 million of the war of all nations who died, and the Easter candle, speaking of the hope of resurrection, will light beside it. At the heart of this Service will be ‘Lord, thou hast been our refuge from one generation to another’ by Ralph Vaughan Williams. As it is sung, young people from the three second level schools in the Diocese will carry forward the facsimile First World War telegrams they have written – all 4,200 of them – containing the names of people from Cork who died. These will be poured out at the foot of the Cathedral’s war memorial column. The central musical item at the Commemoration is a setting of text from Psalm 90 by Ralph Vaughan Williams Lord, thou hast been our refuge. It combines the words of the psalm with passages from the hymn O God, our help in ages past which is traditionally used at times of Remembrance. The hymn tune is quoted in the choir, in the organ and in a part for solo trumpet. This brings to mind the role of the trumpet or bugle playing The Last Post , which will also feature in our liturgy. In 1914, Vaughan Williams at the age of 42 signed up to the Royal Army Medical Corps and acted as a stretcher bearer in France. In 1917 he transferred to the Royal Garrison Artillery. come, Prince of Peace, and reign. The Service will conclude with the organ music Marche Hèroïque by Herbert Brewer. The weekend of remembrance will begin in the Cathedral with a very different event hosted by the Cork Branch of the Western Front Association on Friday, 9th November at 7.30 p.m. – ‘An Evening of Remembrance in Music, Song and Story.’ The Barrack Street Band will take the lead with familiar music from many nations. Timothy O’Sullivan will sing ‘Oft in the stilly night’, and Emily Rose Doyle will sing ‘In the arms of an angel’ . Sarah Barry will sing ‘Willie McBride’. 2018 is the 200th anniversary year of the first performance in Austria of the carol ‘Silent Night’ and all three vocalists will sing it. Jimmy Crowley will perform ‘The Gallant Munsters’ and ‘I know my Love’. A guitarist, Liam Hutchinson, will play ‘The Green Fields of France’. Before ‘The Last Post’ and ‘Reveille’ played by a trumpeter, a piper will play a lament. The choir of St Fin Barre’s Cathedral, Cork under the direction of Mr Peter Stobart, Director of Music. 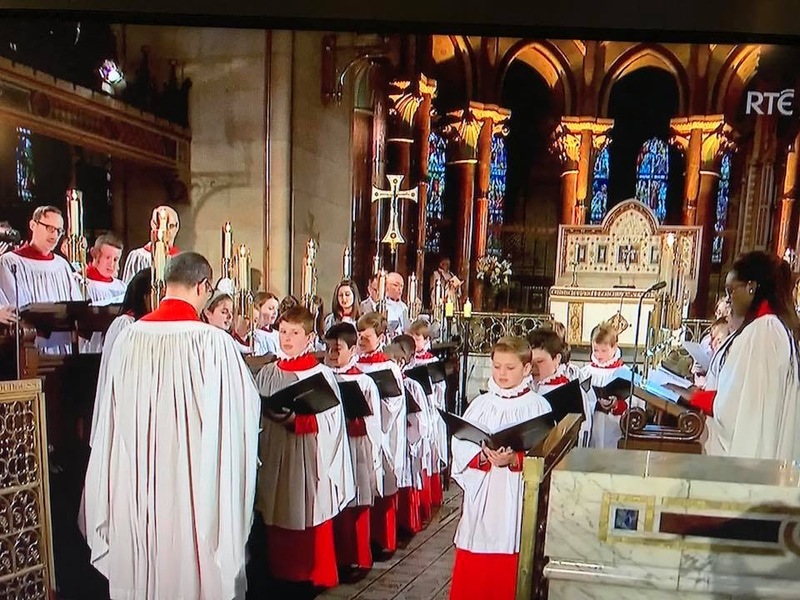 This entry was posted in Cathedral, Cathedral Choir, Centenaries in Ireland, Centenary, Church in Society, Church Music, Church Services, Civic Service, Community Involvement, Contemporary Issues, Cork, Reconciliation, Remembrance, Remembrance Sunday, Schools in the Diocese. Bookmark the permalink.